The Laser Bed Level Utility allows you to level your print bed very accurately and provides live feedback during the leveling process to ensure that you get the best level possible. When you are not running a utility, if you need to manually raise or lower the print bed, you can simply push up or down on the print bed or stage. 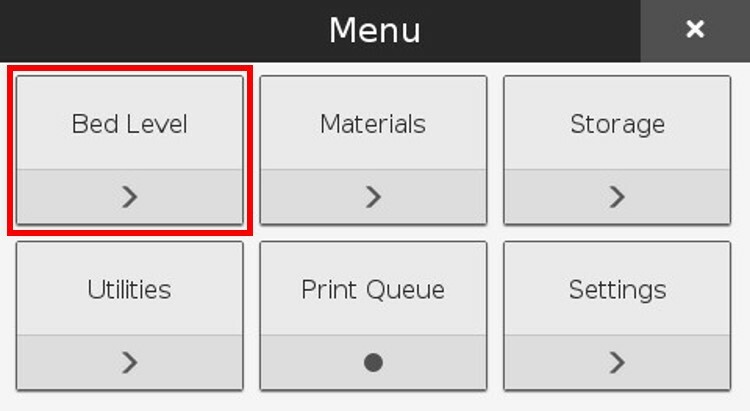 Press the menu button in the upper right corner of your printer's LCD touchscreen. 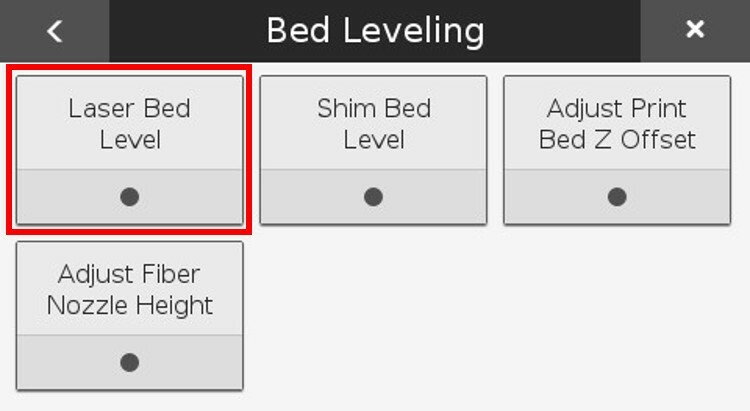 Select the "Bed Level" tile from the available options. 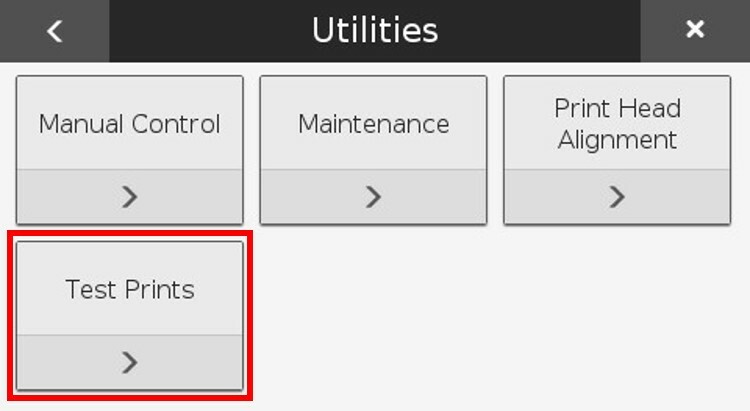 Select the "Laser Bed Level" tile from the available options. Wait for the print head to heat up both nozzles. Read the warning on the screen regarding not putting pressure on the printer during the Laser Leveling process, then press "Next". Wait for the print head to complete the initial scan of the print bed, then press "Next". 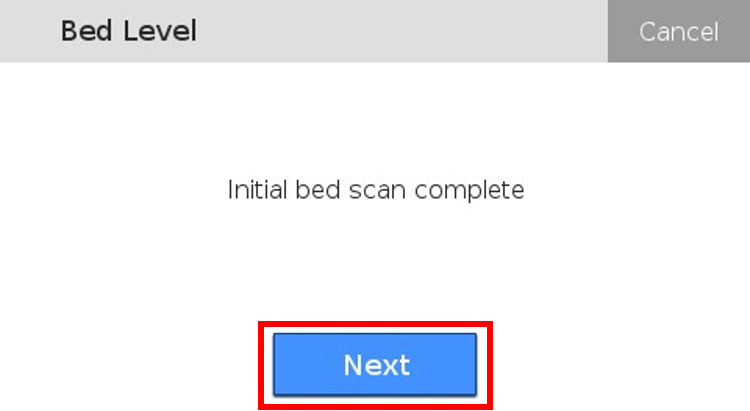 Note: If the bed is either very high or very low, which is sometimes caused by switching beds, the printer may not be able to automatically compensate for the large offset. In that case, the screen will show an error and you will be asked to start the laser leveling process over with the thumb screws loosened all the way. You may also need to adjust your Z-offset in that case. Adjust the first thumb screw such that the arrow on the screen is in the green region on the "Laser Reading" bar. 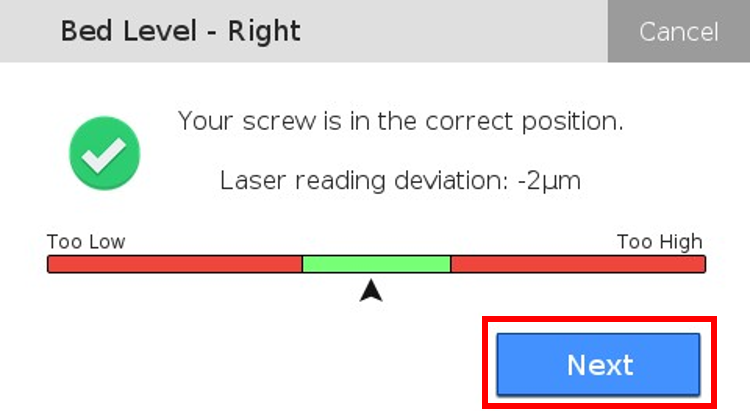 Adjust the second thumb screw such that the arrow on the screen is in the green region on the "Laser Reading" bar. 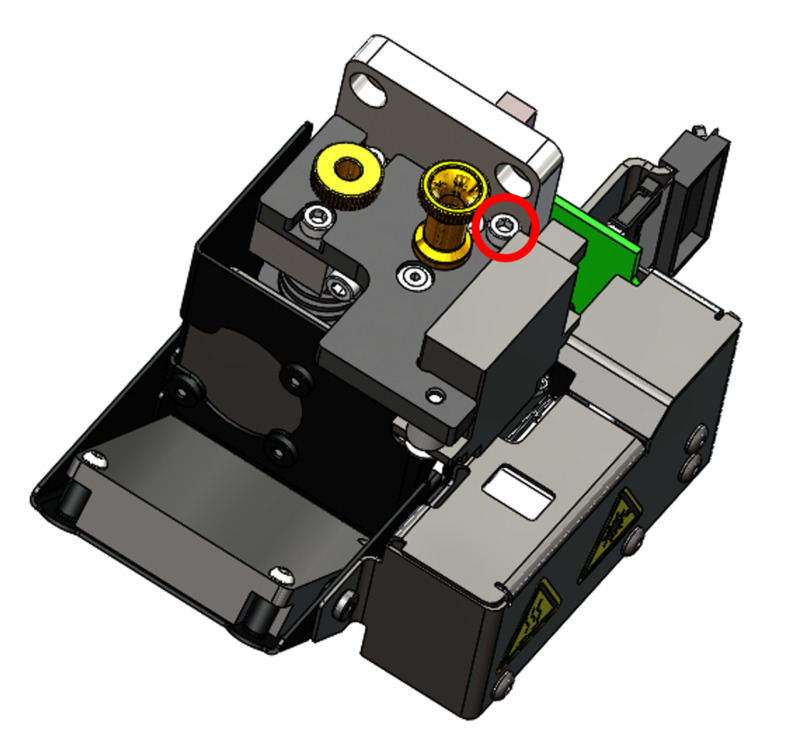 Adjust the third thumb screw such that the arrow on the screen is in the green region on the "Laser Reading" bar. Wait for the print head to complete the second scan of the print bed, then press "Next" to continue the bed leveling process. 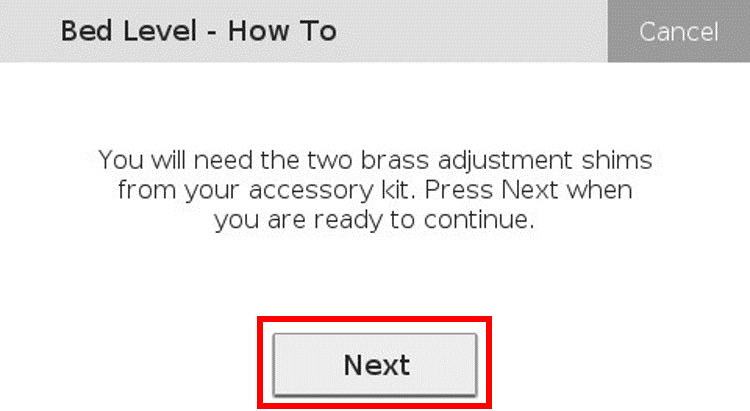 Ensure that you have the two brass leveling shims from your accessory kit and press "Next". 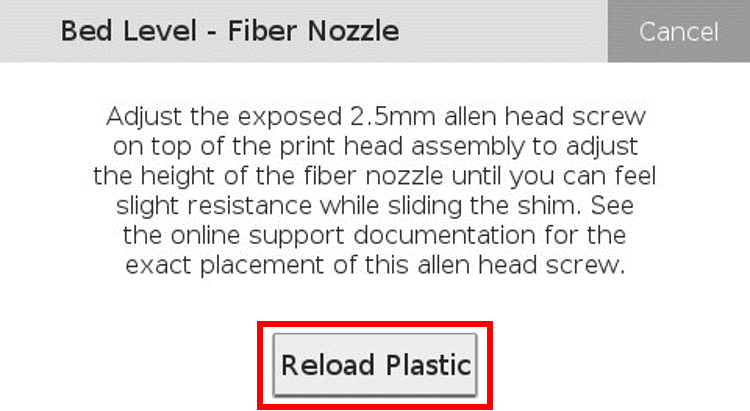 Press the "Unload Plastic" button to slightly retract the plastic from the print head, which will prevent plastic from dribbling from the nozzle during leveling. 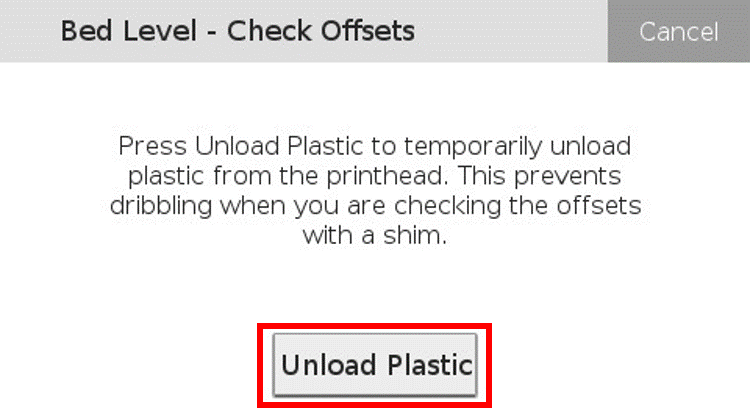 Clear any excess plastic from the print head and then press "Next". Slide the Plastic Shim under the plastic nozzle and use the "Nudge Up" and "Nudge Down" buttons to adjust the print bed in small increments such that there is slight tension on the plastic nozzle. 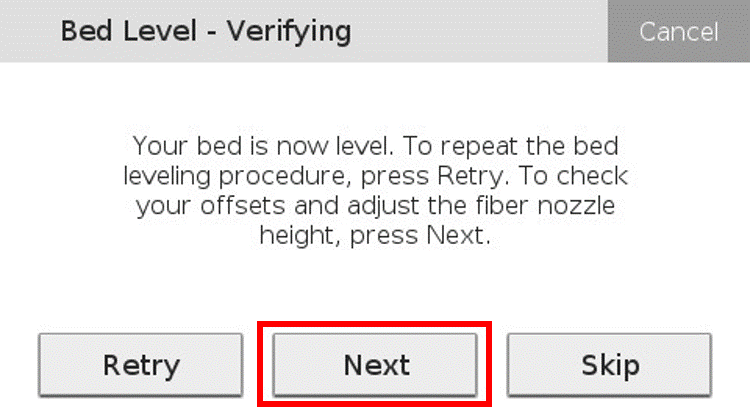 Press "Next" when the bed is at the correct height. 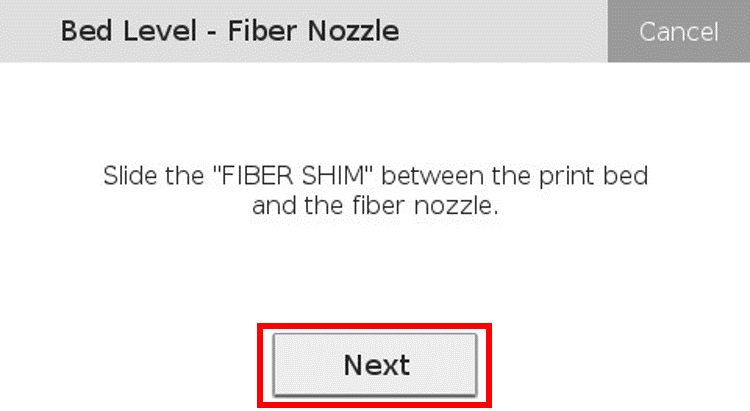 Slide the Fiber Shim under the fiber nozzle and press "Next". Use a 2.5mm Allen wrench to adjust the set screw on the top of the print head such that there is slight tension on the fiber nozzle, then press "Reload Plastic". 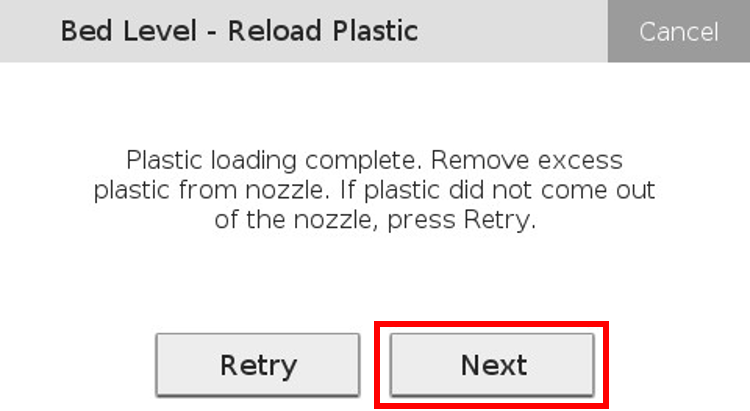 Observe the plastic nozzle to ensure that plastic is extruded during the Reloading routine then press "Next" to continue. Note: If plastic is not extruded during the Reload routine, press "Retry" to extrude more plastic. Repeat this process until you see plastic extruded through the nozzle. 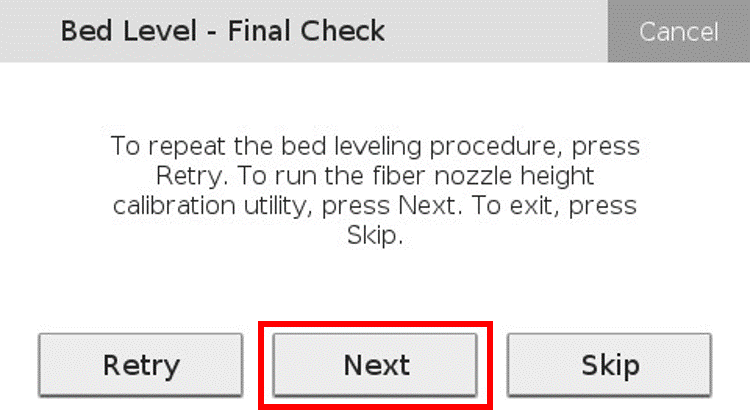 Press "Next" to begin the process of checking the fiber nozzle height with the staircase test print or press "Skip" to exit the utility. 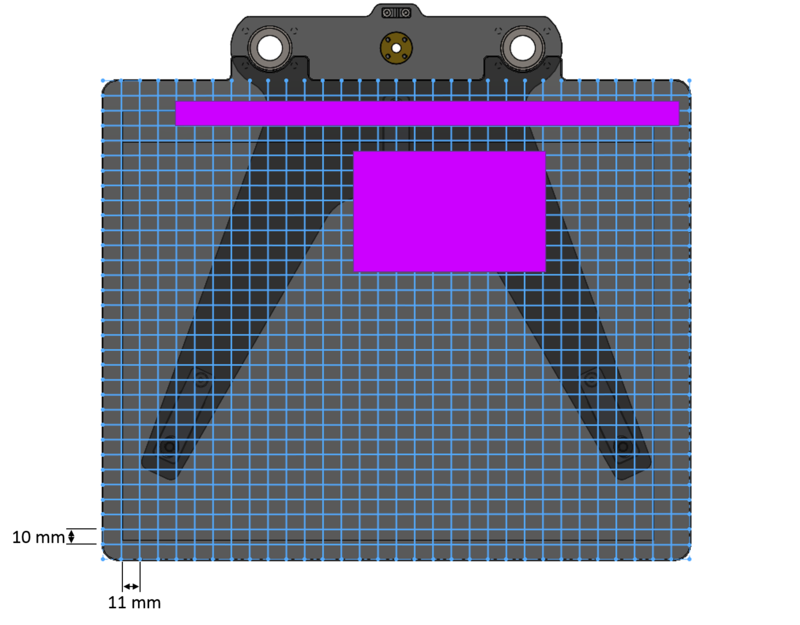 Shim Leveling can be used if the laser level cannot be used for any reason. Shim Bed Leveling may not be as accurate as Laser Leveling but can still be used effectively by an experienced user. 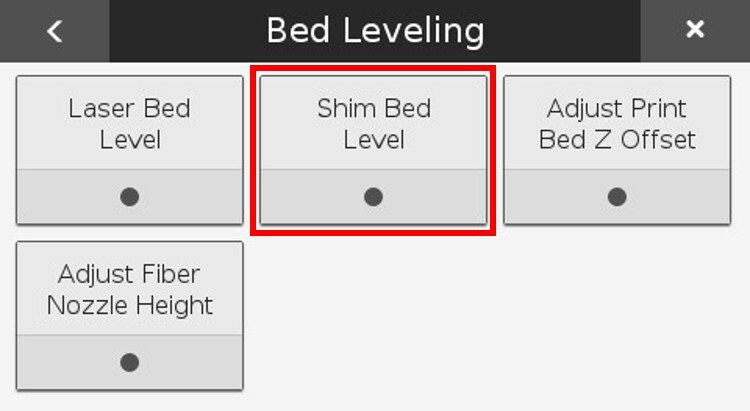 Select the "Shim Bed Level" tile from the available options. 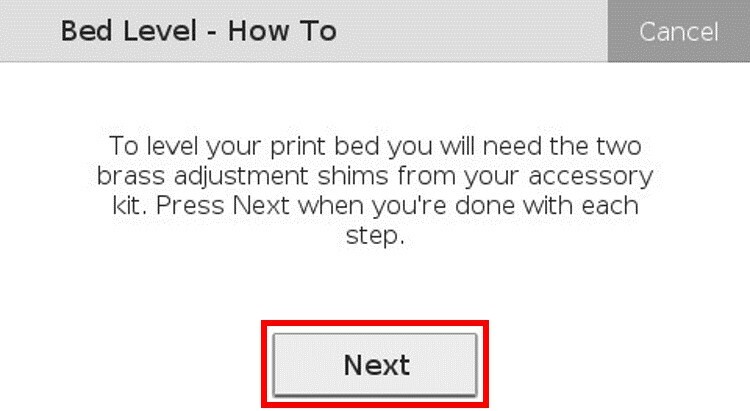 Read the warning about putting pressure on the print bed during leveling and press "Next". Make sure you have both shims and the 2.5mm Allen wrench and press "Next" on the touch screen. 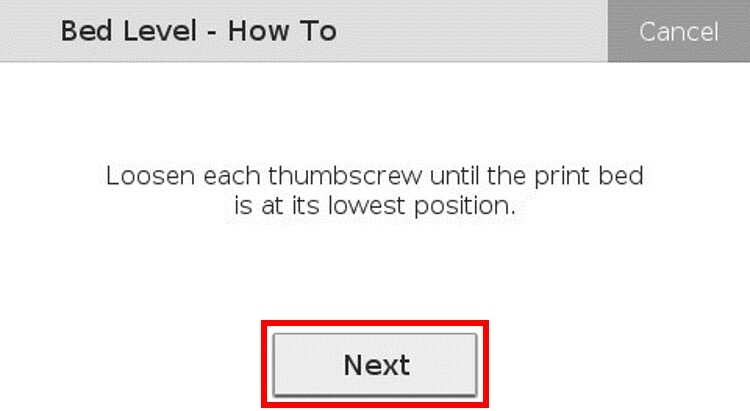 Loosen each thumb screw to its lowest point and press "Next" on the touch screen. 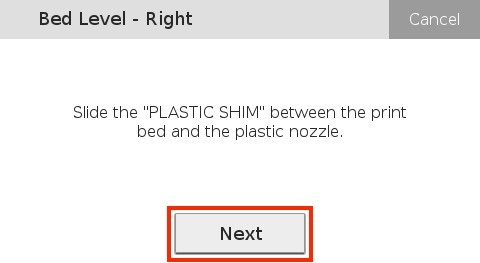 Slide the plastic shim between the print bed and the nozzle and press "Next" on the touch screen. 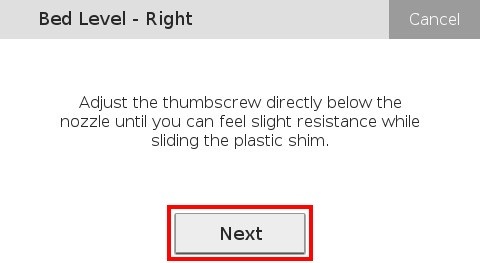 Adjust the thumb screw until you feel slight resistance on the shim and press "Next" on the touch screen. Repeat Steps 7 and 8 for each thumb screw, as prompted by the utility. 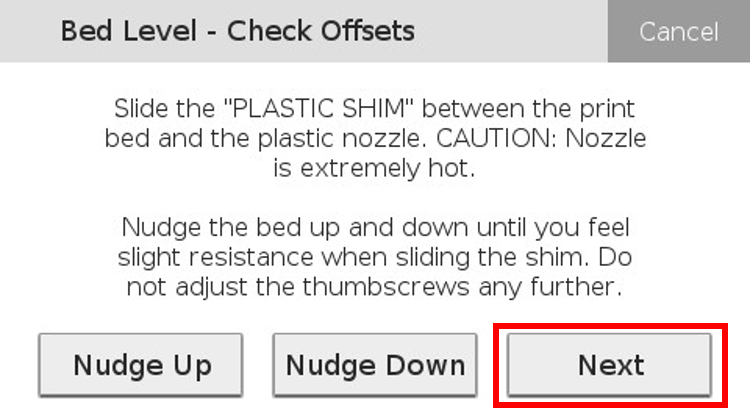 When prompted by the utility, repeat Steps 7 and 8 again for all three thumb screws to verify the tension on each. 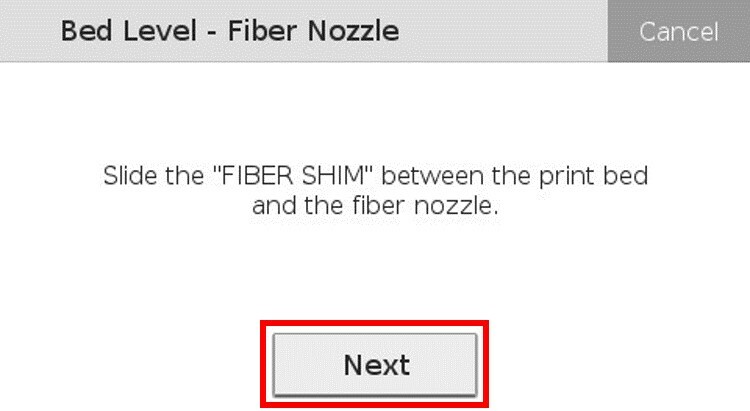 Slide the Fiber Shim between the nozzle and the print bed and press "Next" on the touch screen. Use the 2.5mm Allen Wrench to adjust the fiber nozzle height until you feed slight resistance on the fiber shim. Double check the resistance on both shims and press "Next" to move on to the Fiber Nozzle Calibration, "Retry" to re-level the print bed, or "Exit" to exit the utility. 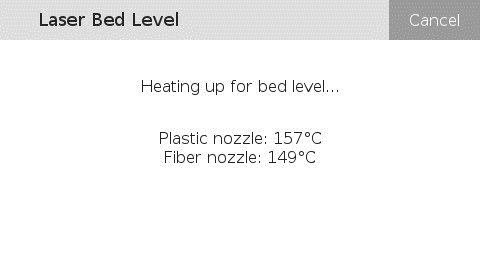 The Fiber Nozzle Calibration Test Print is designed to tell you if your Fiber Nozzle is set too high or too low. If your Fiber Nozzle is not set correctly, it can cause stringing or groove marks in the finish of your part, among other issues. 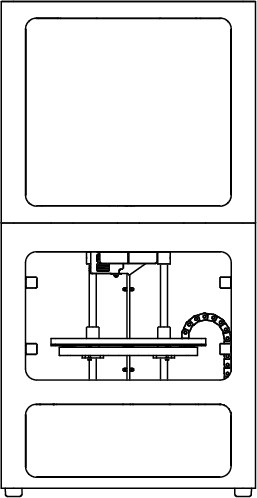 The Fiber Nozzle Calibration Test Print is made up of a series of 0.025mm steps that show the height difference between the plastic nozzle and fiber nozzle. During the course of the print, the fiber nozzle is dragged over the steps at a constant height and leaves marks on the steps that it hits. 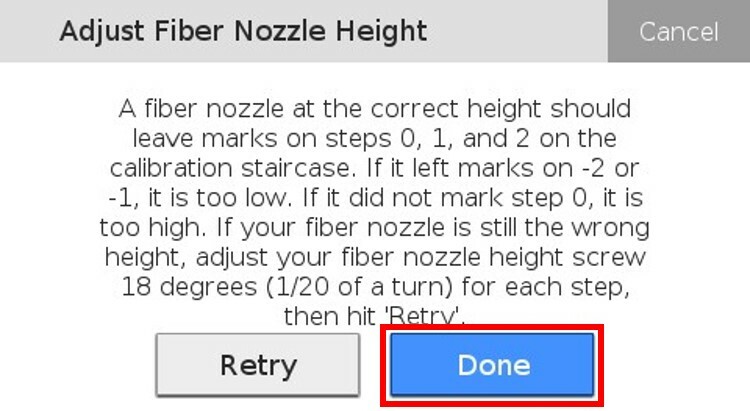 The steps on the part are numbered to help show how accurately calibrated the Fiber Nozzle is. 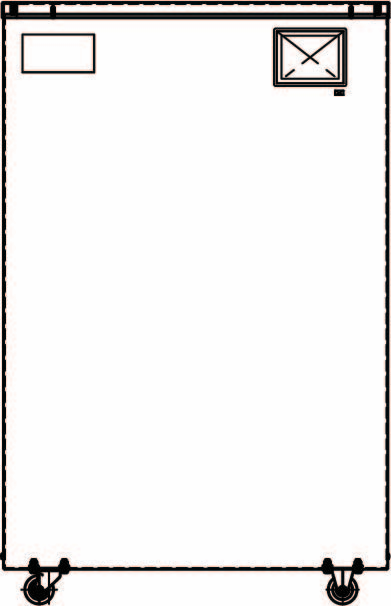 The steps increase in height from left to right, meaning that "Step -2" is the lowest and "Step 2" is the highest. 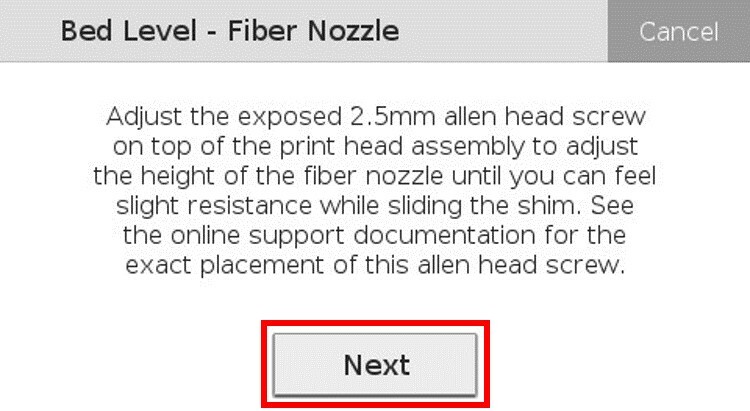 A correctly calibrated Fiber Nozzle would first hit the part in the "Step 0" box. 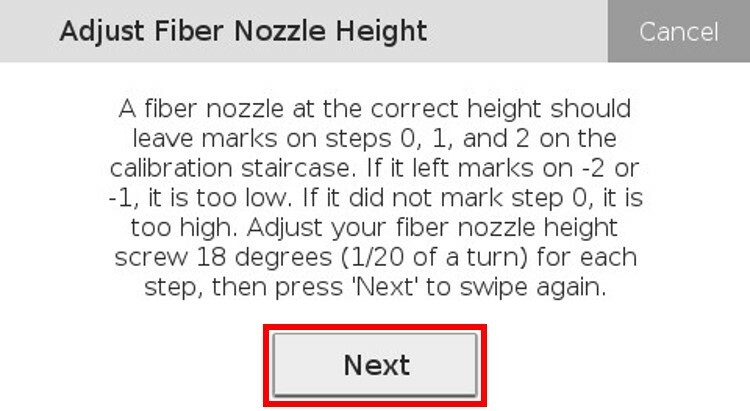 Because the fiber nozzle is dragged across the part at a constant height, if the nozzle hits "Step 0", it will also hit the taller steps to the right of it. Look for the lowest step that the fiber nozzle hits. During this print the fiber nozzle drags across the part three times and pauses between each drag to let you see where the nozzle hit and adjust the fiber nozzle height. It may be easier to take the print bed out of the printer and hold it up to the light to see the marks on the steps better. Clean your print bed and apply glue as shown in the picture below. Place your print bed into your printer. 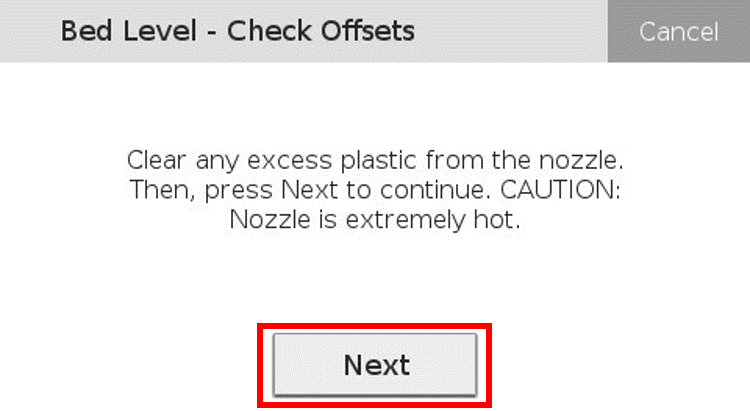 Select the "Adjust Fiber Nozzle Height" tile from the available options. 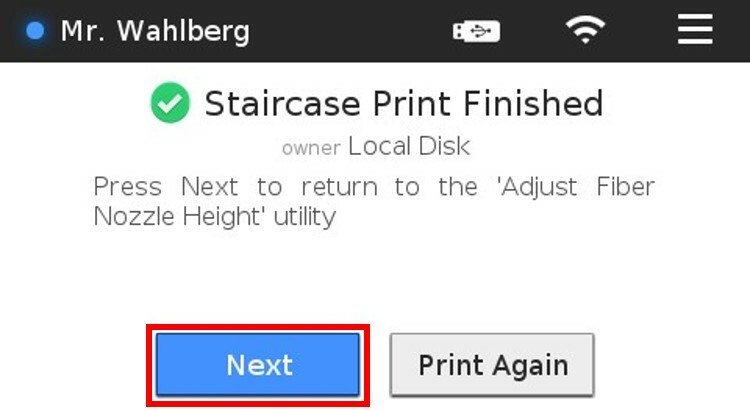 Select "Print Staircase" on your printer's touch screen. 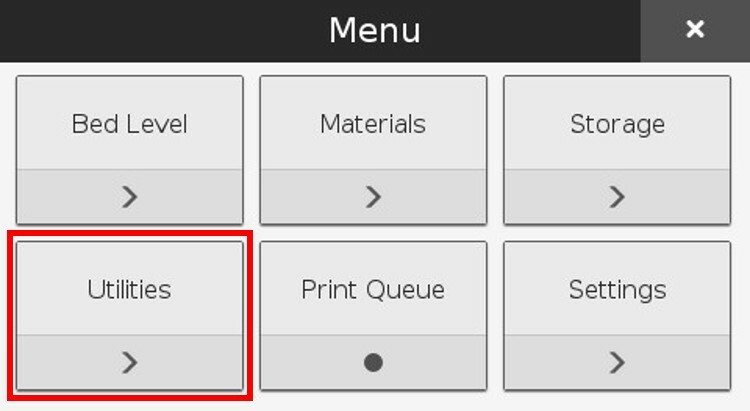 When the print finishes, press the "Next" button on the printer's touch screen. 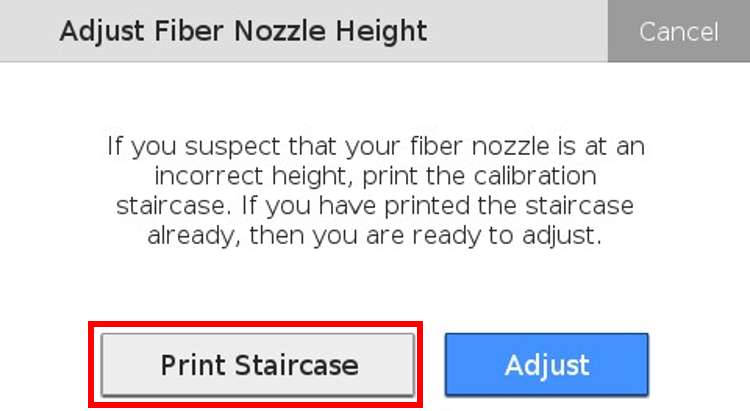 Once the fiber nozzle has finished heating, press "Next" to swipe the nozzle over the staircase print. 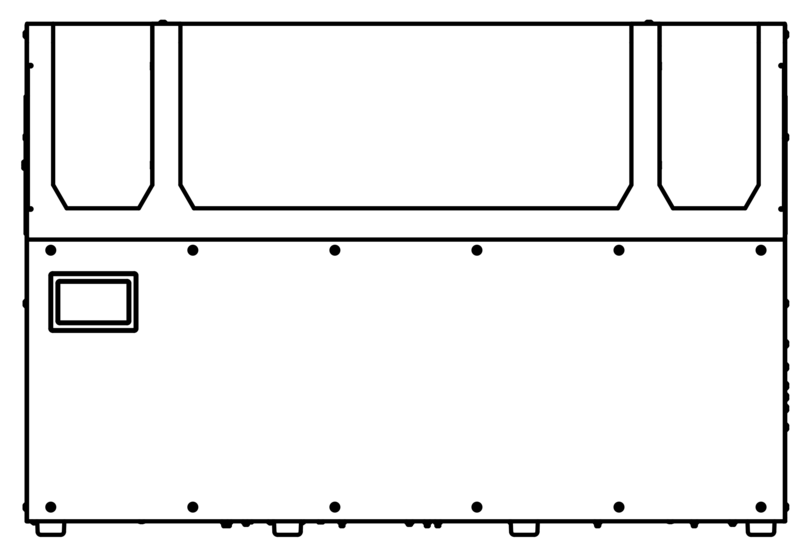 Examine the part without removing it from the print bed, and identify the left-most box that has a drag mark from the fiber nozzle running over the part. If the line begins in the "Zero" box, your nozzle is correctly calibrated. If the line begins in a negative numbered box, your nozzle is too low. If the line begins in a positive numbered box, your nozzle is too high. Use a 2.5mm Allen wrench to adjust the fiber nozzle height on the print head. Note: Rotating the adjustment screw 18 degrees will raise or lower the fiber nozzle by one step height in the test print. Rotating the Allen wrench in a counterclockwise direction will cause the Fiber Nozzle to move up. Press "Next" on the printer's touch screen to swipe the nozzle over the part again. 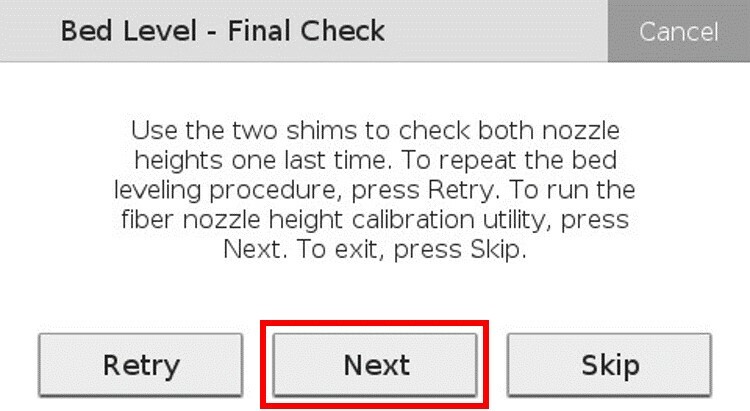 Continue swiping and adjusting the part until your nozzle is correctly calibrated or you have swiped three times. After the third swipe, press "Done" if the nozzle is correctly calibrated or "Retry" if the nozzle needs further calibration. Note: If the fiber nozzle was high when it swiped over the part, the nozzle can be swiped over that row again for further adjustment/checking. 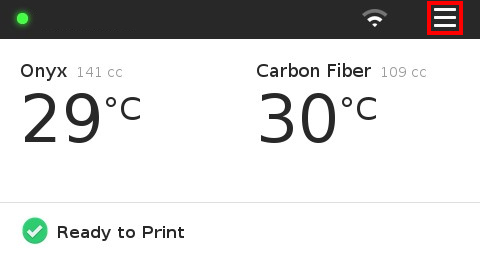 This will not affect the printer or calibration. 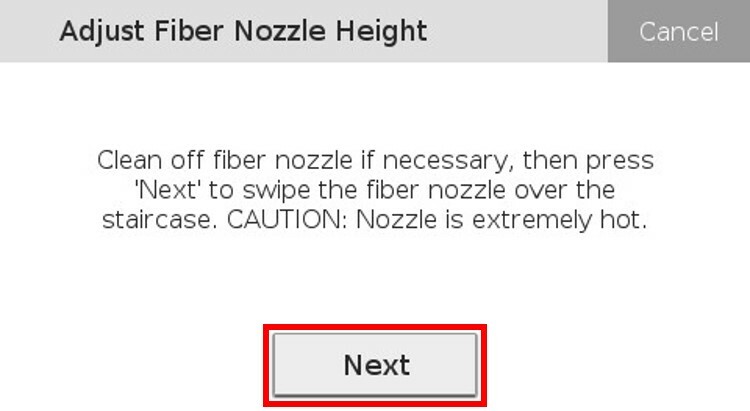 If the nozzle was too low when it was swiped over the part, the nozzle can still be swiped over that row again, but will not provide any further diagnostic information. 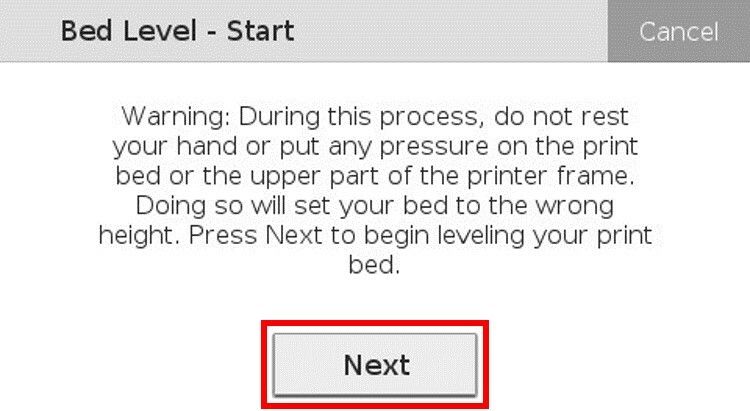 If you are currently running the Level Print Bed procedure, press "Cancel" in the upper right corner of the LCD sreen. 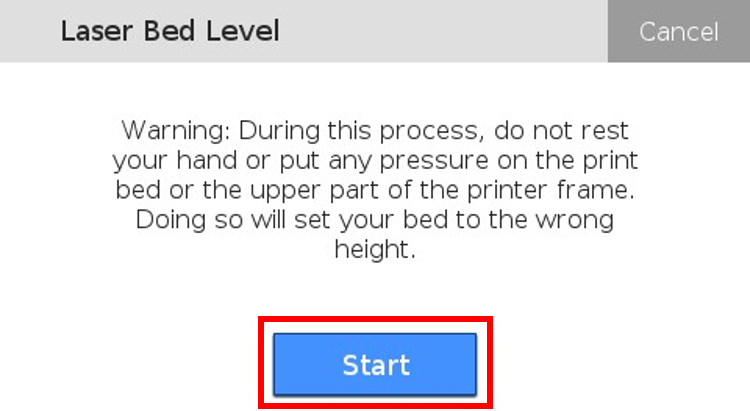 Select "Adjust Print Bed Z Offset"
Once the Z-Offset is corrected, you may restart the "Level Print Bed" procedure.